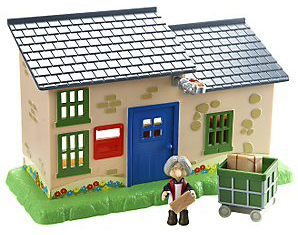 The Post Office Playset features Mrs Goggins and her Post Office. The playset is reversible so that you can play with the front facade or put the figure of Mrs Goggins inside the Post Office at the back. Included is a little post trolley and two parcels. The Post Office has a postbox and opening door.